For the second year, I worked with Mass Mutual and actor Hill Harper on the #FutureSmart campaign. How does this have to do with living a creative lifestyle? Well, sit right down and I’ll gladly explain! No matter what kind of life we live, funds are a must to keep a roof over our heads, nourish our bodies, get to and from jobs, and so much more. . The FutureSmart program is all about teaching kids (or kids at heart) at a young age to make smart money choices, to open a savings account, and be self-aware of their buying choices. As a mom of two twenty-somethings, I know this is crucial information. The way we teach our kids about money will stay with them as adults. We want our kids to be self-reliant and independent and free of financial stress. The earlier they learn, the better. 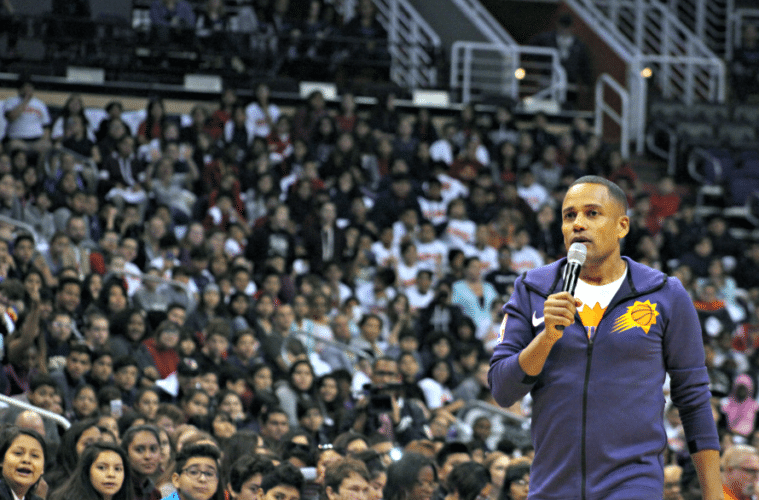 I love that Hill Harper is so dedicated to this cause. He is one busy guy, he is a well know actor, speaker, bestselling author and even launched his own skincare line. His list of accomplishments is crazy. And rather than focus on his own life, he makes time for this program. Three of us Phoenix bloggers interviewed him before the kids rolled in. 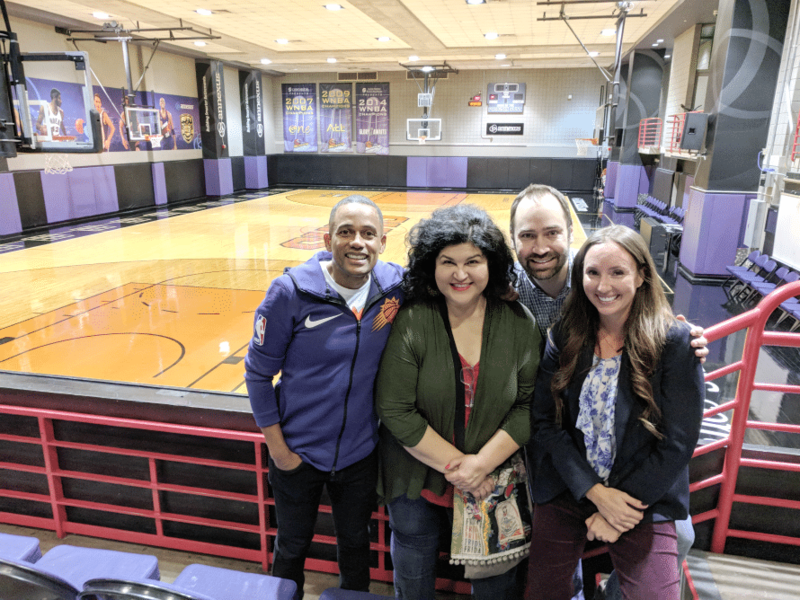 Hill Harper, Dylan from WellKeptWallet.com and Holly from AsCuteAsAbugsEar.com. I wish I had this experience as a kid. Growing up, my parents always said things like “You better save money!” Money doesn’t grow on trees!” – the usual lectures. But they never actually showed us HOW to save money. It took me going flat broke at age 22 to admit to my parents my rent was past due, my car payment was past due, and I had a couple thousands of dollars in credit card bills after a trip to Europe. My dad sat down with me and we went over each bill and I learned from that day forward how to make better choices. And still, to this day, I feel like I’m still learning! FutureSmart is such a brilliant program for kids. My kids are moved out, but I still shared this with them. Here is the website, if you have kids or grandkids, take time to introduce them to this awesome info! It’s FREE. There are different courses that kids can take at home, or in the classroom. 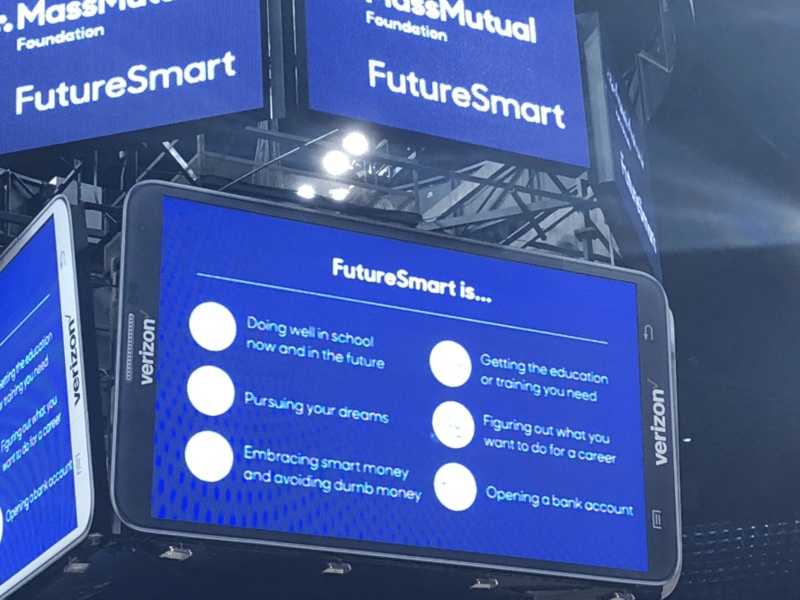 You can even register your kid’s school to see if they can be a part of the different arena tours FutureSmart holds around the country. 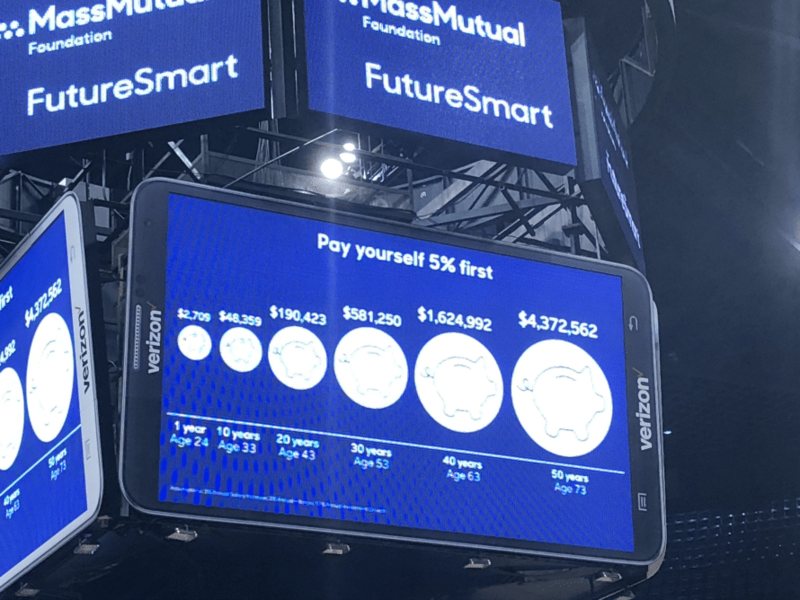 The MassMutual Foundation has teamed up with select NBA teams to educate middle school students about smart money management through live interactive events. To date, FutureSmart Challenge events have educated more than 40,000 students across 17 major cities: Atlanta, Boston, Charlotte, Chicago, Dallas, Denver, Houston, Los Angeles, Memphis, Miami, Oakland, Oklahoma City, Philadelphia, Phoenix, Portland, Salt Lake City, and Springfield. This slide up here is what blew my mind. If we can get our kids to start saving 5% of everything they bring in, they will definitely have a more secure future. We have to do more than just say, “Save your money!” We have to take them to the bank, open a savings account and teach them to set aside those funds. Help them start a new healthy habit. By the way, we can do it for ourselves, too! Now let’s talk Hill Harper. I hadn’t heard of him until last year’s FutureSmart event. Ever since I’ve seen him everywhere! Did I mention he went to Harvard and is a cancer survivor? And he hosts these FutureSmart events all over the country! None of that gets in the way of his humbleness and kindness. He is so genuine with his time and attention. He sat down with each one of us bloggers before he started the arena presentation. He is truly passionate about helping people of all ages get right with their wallet! Here is my interview, I asked about how someone at my age can still work to save money, here’s what he said! Okay, if you can’t listen – he told me that people my age are the sandwich generation. We are caring for our kids, as well as our parents. We often put ourselves last because of that. However, he said 50 is only “halfway” through life – we have a long way to go and it’s smart to set up a savings plan that won’t be touched for at least 10 years. He told me to leave my 401k savings, but move it to a plan to help it grow. Basically: IT’S NEVER TOO LATE TO SAVE AND/OR MAKE MONEY! Talk to them about smart money choices, teach them to research before they buy. Open a savings account and put money in regularly, even if it is a little at a time. Take them grocery shopping and teach them how to choose wisely. Talk about college at a young age, help prepare their minds for the idea. Help them learn how to make a plan – whether it is for homework, saving money, etc. Once they learn the power of planning ahead, they will be ahead of the game! 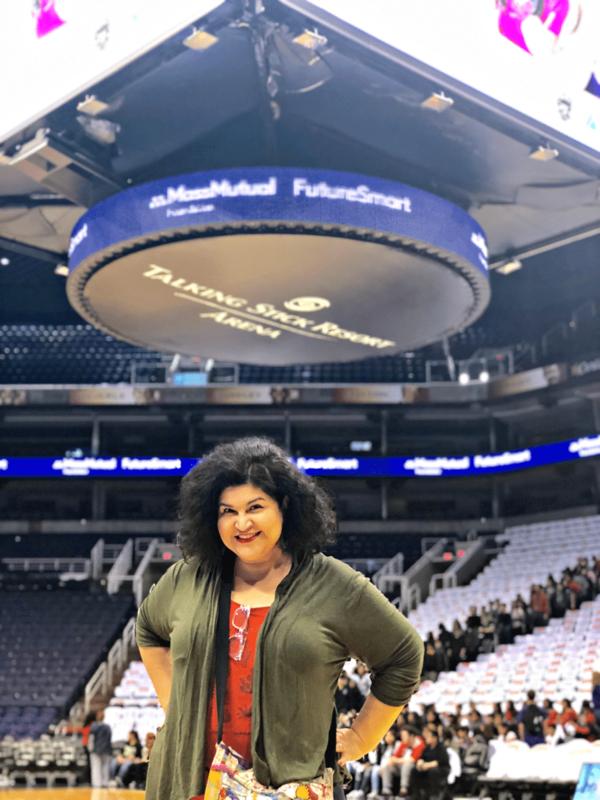 I really loved my time at this event – and sharing these tips with all of you! How did your parents teach you about money – and how did it affect the way you taught your own kids? I’d love to know! 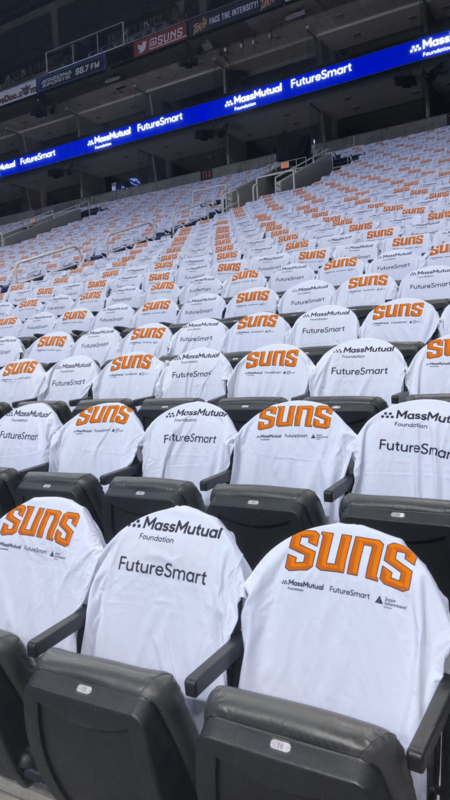 And don’t forget to check out the #FutureSmart program!